As I write this, I am still slightly dizzy from the massive sugar overdose inherent in the mostly-annual Cake Contest. Despite this, the contest was a brilliant success. Here's a picture of the judges as we consider our picks for the winning cakes! 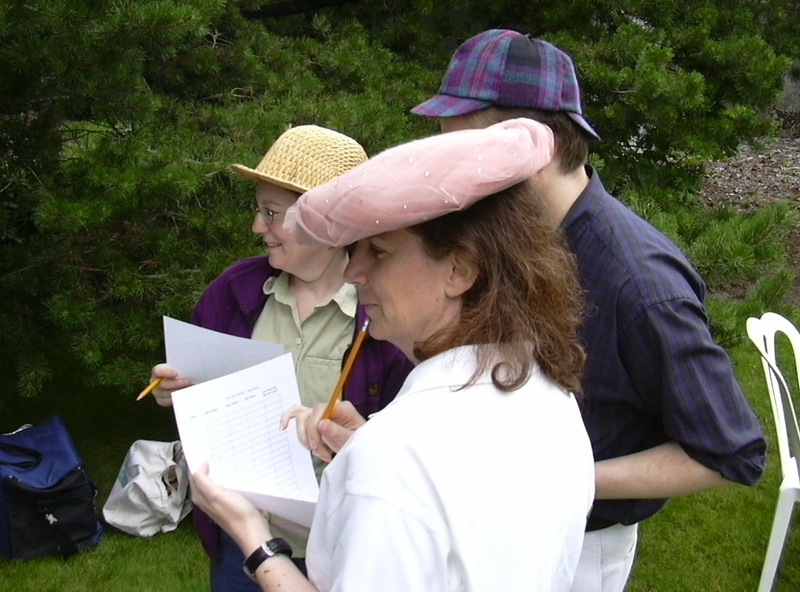 See the deerstalker hat I borrowed from sanguinity and grrlpup? Easily the best hat! Top Left - Most Creative: "Fire" Breathing Dragon Cake. The platter is a foil castle, with paper towers, gold coins are scattered about, representing the dragon's hoard, and he's spotted with chocolate-peanut clusters, just like a real dragon. But the coup de theatre was the dish tucked below with water and dry ice, so his nose burbled mist, and sometimes water. Don't think about that too much. Amazingly, there were two dry-ice-based-fire-breathing-dragon cakes. The other was a bit more artfully constructed, but lacked the accessories. If you're thinking that this one looks like it was made by two preadolescent boys, you'd be right. 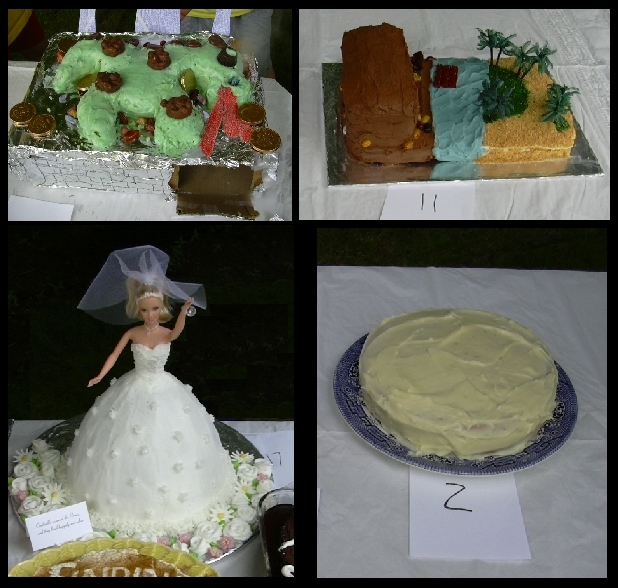 Top Right - Best Theme: The River Styx Cake. This year's theme was "Myths & Legends," and this entry beat out the "Athena Springing From the Head of Zeus" Cake (Really; with a Xena doll playing the part of Athena) and "The Hammer of Thor" Cake. As you can see, the River Styx separates the tropical Land of the Living from the Underworld Bunker. A red licorice raft ferries the souls of the newly dead across the river, where they are greeted by the dark, shrouded figure of Dennis DeYoung. Lower Right - Best Tasting: Pumpkin Spice Cake. Sure, it doesn't look like much, but it was very tasty! Notice that it was cake #2; so we sampled fifteen more cakes after it, and still came back to this one as Best Tasting. Winners each got a custom-made t-shirt announcing their winning category, and they will keep one of the Traveling Trophies for a year. It was with some sadness that I returned the trophy from last year's Best Looking win (the butterfly cake, remember? ), but that's just incentive for next year's entry. That's far in the future, though. I won't start planning next year's cake until August.